SET-UP, Friday, April 26, 2019, from 9:00 a.m. to 12:00 p.m.
TAKE-DOWN, Saturday, April 27, 2019, from 2:00 p.m. to 5:00 p.m. Stream Clean Ups Every First Saturday of the Month, 9:00 a.m. to 12:00 p.m.
Every Wednesday 9:00 a.m. to 11:00 a.m.
*FOSTER BOTANICAL GARDEN: CALL: 808.768.7135 for information. Click on this link for all the latest news and events at Foster Botanical Garden. * Enrollment reservations need to be made a week in advance of class start date. Space and materials are limited, early enrollment encouraged. A collaborative group of carvers' will present a lecture and demonstration of the crab claw carving technique at Foster Botanical Garden. The event will include a brief cultural history of the Narcissus by Stephen Fong, a video presentation of the carving technique by Cyrus Won and actual demonstrations of the carving technique by Dorinda Won, Wayne Ng, Stephen Fong and Cyrus Won. Participants will be able to ask questions and visibly see how this technique is done. We anticipate (weather permitting) having actual blooming Narcissus available for viewing. A book authored by Cyrus Won about this technique will be available for purchase in the gift shop. Sunday, January 27, 9:30 a.m. to 11:30 a.m. Learn the shibori technique to make your own indigo colored scarf. 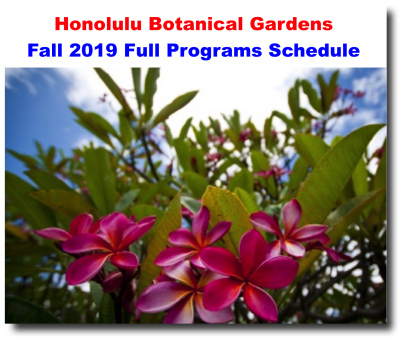 HO‘OMALUHIA BOTANICAL GARDEN: CALL: 808.233.7323 for information. Click on this link for all the latest news and events at Ho‘omaluhia Botanical Garden. WAHIAWA BOTANICAL GARDEN: CALL: 808.628.1190 for information. Click on this link for all the latest news and events at Wahiawa Botanical Garden. of paper narcissus, a flower symbolic of the New Year. Age 8+. All ages welcome, with children accompanied by an adult. LILI‘UOKALANI BOTANICAL GARDEN: CALL: 808.768.7135 for information. Click on this link for all the latest news and events at Lili‘uokalani Botanical Garden. Volunteers Needed for Stream Clean Up! Supplies provided. Wear covered shoes..
KOKO CRATER BOTANICAL GARDEN: CALL: 808.768.7135 for information. Click on this link for all the latest news and events at Koko Crater Botanical Garden. www.honolulu.gov/parks/hbg OR Click the Facebook logo for each garden's page.